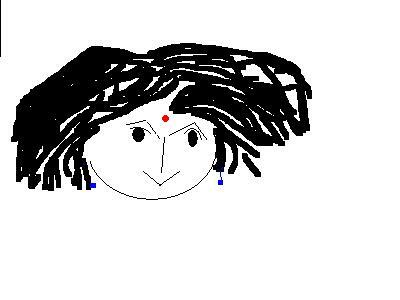 finally bongmom blessed me with her visit;) seriuosly i love ur ways... theres something about the way you write..
i have had d chire doi aam...i love it... i have had many bong frens thruout my life.. so love bong food... do u make that patasha wala kheer? wow wow, what lovely culinary creation with mango and i love the poem too... Always you rock with ur style Sandeepa! It is absolutely worth to go to the event! The poha and mango and another unusual combo but delish! Hi, couldn't see the pix. I went home this week to see my newborn niece and the heat hit me hard with the realisation that I'd forgotten just how hot it could get there in the summer - temps are 45, 46! Since you mentioned Durga, I must tell you that the trip home was full of her mention as that's whom they want to name the niece after! They've not settled on anything yet. aha! chire diye aam , khob bhalo lage khete ....Ki moja .. Loved the mango art and poem also .. I loved that poem on mango and of course your art is wonderful..
and my daughter is now going to 3rd std! beautiful art piece. Mr. Mango is looking good. Lovely poem. everything looks good,..thnks for sharing,..recipe looks good,..
Sandeepa, the heat I did not even notice it when I was surviving it. I take heat to the cold any day. Chire-Doi-Aam love the name. Bengali is sure a lyrical language. Poha upma with mango, they make it in the south too but I have never tasted it. Looks good. Is your child off school now? 11th is last day here. After that i have to cook lunch and dinner too,They used to eat lunch in school! More work for me! Thank you for the lovely story and recipe, Sandeepa. Any food that evokes feelings of love for your Ma is high on my list. Stay cool! That was a lovely mango face. Great job. that mango art is so beautiful. and this dish is something i'd love to try, but using mango pulp, ''cos that's all the good rips mango we get. hahahahaha the 1st photo simply made me laugh...really cute art:)..the poha dish looks delcicious. adorable looking Mr. Mango Head (aka known as Mr. Potato Head's cousin along for a summer visit!). I love that mango man :). Very interesting recipe. Love the poem and love the art even more! U always rock. Mr Mango to darun mojar. I especially like his hair and expression. And sweet poem there. I love that you reminded me of chire am doi...jai ekhon aam kine aani. You are so right about "There is pure pleasure in seeking out comfort instead of it being served on a platter". e.g. I still yearn for that feeling when I drank water out of metallic glasses in a hot day. Water is no more so heavenly anymore. And the feel of cool floor and aar dupure thanda jole snan...I know what you are talking about. You are a wizard of words...I will say it again! the name by itself sounds like poetry - this sound fantastic given the heat in chennai right now. thanks for sharing such a happy recipe. Hi, I found this blog from Aayi's recipes and must say I am impressed. Quite a few food blogs I have explored in the past few days and all of them are equally good. Hats off to you guys for being this creative and innovative with food, n for keeping the tradition alive at the same time. Loved reading your post and the mango face is real funny. :) Thank you Sandeepa for this soulful contribution to mango manthram event. 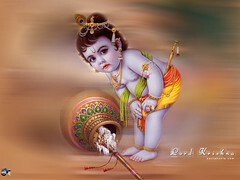 Chennai itself is hot , where did you venture ? And congrats on the niece. Durga has so many wonderful names, some I had no clue of. Even my daughter's name is one of Durga's but I had decided on it becuase I had loved how it sounded on my tongue, later I came to know that it was one of Durga's 108 names. If you have had Curd Rice with mangoes and sweetened it with jaggery you can imagine how this would taste. This is not like Upma as it is not cooked at all, everything is in raw natural form. Hey this is not cooked at all so is not like upma which needs to be cooked right ? Yeah as I told Shn, S would have come up with something better maybe ;-) Anyway I have labelled her "Ms. Know All" as whatever I try to tell her, she insists she already knows. Ami nije koto din por chire-doi-aam khelam je ki bolbo :D And did you ever see a surahi or "kunjo", the earthen pots to keep water cool at home ? Thank you for visitng my blog and leaving encouraging words. na peye tai bhari dukkho. Eki...kobita berochche je...tomar influence I tell you! Tomaar comfort food ta ami khai na but its so so popular with most of my family . AG has it with muri but at home Ma used chire like you . What a beautiful post! I loved reading about the rituals behind the dish, and your memories. Thanks for sharing. Now I'm off looking for this 'beaten rice'! I'll send you some sunshine :) The mango is cute.... The poha is something I'd try... we make something close we have as a snack. yeah sweltering sumer just about now sounds so nice! !your narration makes this dish special..can't treat it just as a snack. So glad to get my net connection back! I was missing my fave posts for four whole days! That looks lip smacking..I mean look at the lovely ingredients. We make sweet poha with jaggery but never with fruits...Got to try this...maybe I could ask H to make it on her own for her evening snack today:) Oh..that first one reminds me of Oswald:)-Cute! 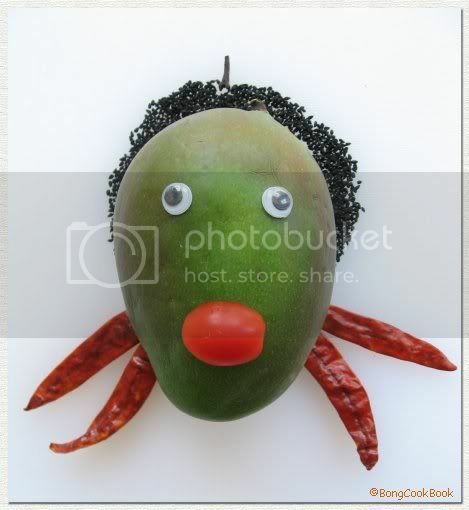 Very creative and cute looking mango. The first pic is so creative.good one. I chanced upon visiting your blog looking out for some recipes. But I do visit nowadays whenver I get time to. You really write well.....too many memories came flooding back....Ma/ Grandma and the thanda mejhe! Hi Sandeepa, I liked what you wrote about mangoes. Saw it at Mahanandi. A really nice event - this combo of art and cuisine :). Sandeepa that guys cute and your recipe really a cooler. 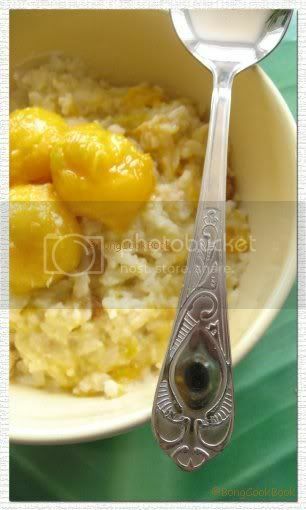 For some strange reason I have never enjoyed the Bengali-style Chire-Doi. Prefer Chire done spicy mostly. But mango season is always fun; the rains are finally here, so it's on the verge of ending! Hey Sandeepa Mango Creation looks fabulous. Lol! I thought this website was about making bongs. I am trying to figure out how to make a bong out of a mango and that is what I thought this was. You should change your name Bong Mom to something that wont be false advertising. Did you ever think Anon that a "Bong" has more meaning than what you have been searching for. www.bongcookbook.com is very informative. The article is very professionally written. I enjoy reading www.bongcookbook.com every day. a nice blog! apnar jodi "Khoi Chur er Moa " -r recipe jana thake, please share korun na. I'd love to learn the way it should be made. A friend's mom used to make it when we were toddlers - she used to add Michhri, Saunf in it. I have been trying to locate the recipe for a while.